Santa Ana, CA (February 20, 2018) – NIS America is excited to announce that GOD WARS The Complete Legend will be coming to North America and Europe this Fall on Nintendo Switch™ as a physical and digital release! GOD WARS The Complete Legend is a tactical RPG that explores the untold history of Japan through folklore and tactical combat. Gamers will experience the traditional stories of Japan’s origin through the lens of three warring nations, with a massive expanse of tactical options to develop their strategies from including a myriad of character classes and equipment within innovative and challenging stages. 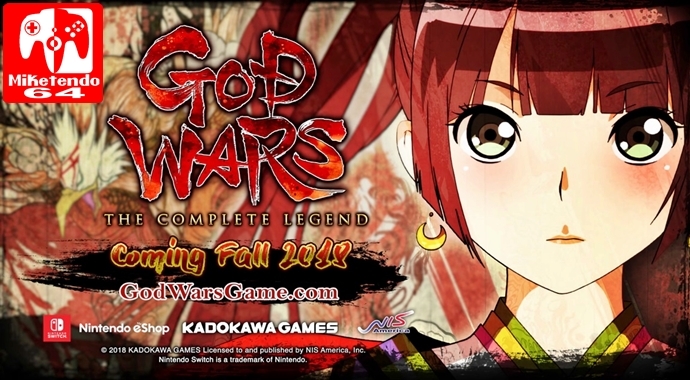 GOD WARS The Complete Legend will feature all of the content and DLC from GOD WARS Future Past, as well as a brand-new character, Orihime, and the Legend of Yomi: a new dungeon that outlines the story of Kaguya over 50 stages! The Legend of Yomi includes the prince of Hyuga, Momotaro, his crew as playable characters, and multiple endings. GOD WARS The Complete Legend also features quality of life changes that make GOD WARS The Complete Legend the definitive release of the game. PS4 and PS Vita owners of GOD WARS Future Past will be able to play the new Legend of Yomi DLC on PlayStation™ Network, as well as the quality of life updates. Visuals from Another Age – Inspired by traditional Japanese ink pain>ng and wood carving art, the artwork of GOD WARS will transport players to an age filled with mythology and wonder.